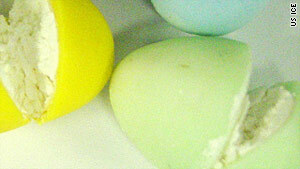 Much of the cocaine seized Thursday was hidden inside pastel-colored Easter egg candies. Los Angeles (CNN) -- Two days before Christmas, the alleged smuggler apparently thought Easter eggs would be the perfect ploy to conceal 14 pounds of cocaine. U.S. Customs and Border Protection officers sensed something was a little off with candy for the wrong holiday, a spokeswoman said. "That's certainly an anomaly, isn't it? They're trained to detect anomalies in all kinds of situations," said Lee Harty, a spokeswoman for U.S. Customs and Border Protection. "It's an unusual concealment method -- at least for this time of year. Maybe not for spring." Esteban Galtes, 23, of Miami, Florida, was being held without bail being set Monday after he asked a federal court in Los Angeles to continue his Monday hearing until Wednesday, said U.S. Immigration and Customs Enforcement spokeswoman Virginia Kice. Galtes' attorney could not be reached for comment Monday evening. Galtes is accused of smuggling cocaine into Los Angeles International Airport after a week-long trip in Colombia, and he's charged with importation of a controlled substance, which carries a maximum penalty of life in prison, authorities said. "When they inspected the candies and they cut it into them, a white powdery substance was exposed, which tested positive for cocaine," Harty said. The cocaine has a street value of more than $100,000, authorities said. "Drug traffickers are always trying novel ways to conceal their contraband," said Claude Arnold, special agent in charge of the U.S. Immigration and Customs Enforcement's Homeland Security Investigations in Los Angeles. "But cocaine camouflaged as Easter candy is one of the more unusual tactics we've come across. Obviously two days before Christmas, this defendant didn't expect his trip would end with federal officers conducting an Easter egg hunt," he said in a statement. Galtes told the officers that the eggs were for his two children, federal authorities said. "This smuggling attempt and interception should give notice to all persons involved in this illicit trade to think twice when attempting to smuggle cocaine or other prohibited drugs/items into LAX," Carlos Martel, acting director of Los Angeles field operations for Customs and Border Protection, said in a statement. Homeland Security investigators are continuing to look into the smuggling operation, officials said.